The tiny tweaks in the update pushed to Windows 8.1 users last week transformed Microsoft’s Modern UI-tinged future into a truly PC-friendly operating system for the very first time, but as welcome as the changes were, they didn’t sit well with everyone. While the update makes Windows 8.1 much more usable with a mouse, it also broke down the wall separating the desktop and the interface-formerly-known-as-Metro. That’s best symbolized by Windows 8.1’s anywhere, everywhere desktop taskbar, which—in addition to now supporting the pinning and minimizing of Modern apps—now appears across the OS, including the Live Tile’d Start screen and Modern-style apps. As a mouse jockey, I love it; the universal taskbar really helps merge the dueling interfaces into a cohesive whole, and it’s greatly improved the speed of my workflow while using Modern apps. That said, neither the Start screen nor Modern apps were created with the taskbar in mind, and its sudden appearance can sometimes cover on-screen elements in some apps—especially if you station your taskbar at the sides or top of your screen. Plus, it just plain looks weird in Modern apps. But fear not! Like most Windows elements, it’s easy to cast the universal taskbar into oblivion. It’s just not very obvious how to do so. To kill the universal taskbar, you have to kill the taskbar’s newfangled ability to house Modern apps. Right-click in an empty space on the taskbar, then open the Taskbar tab. 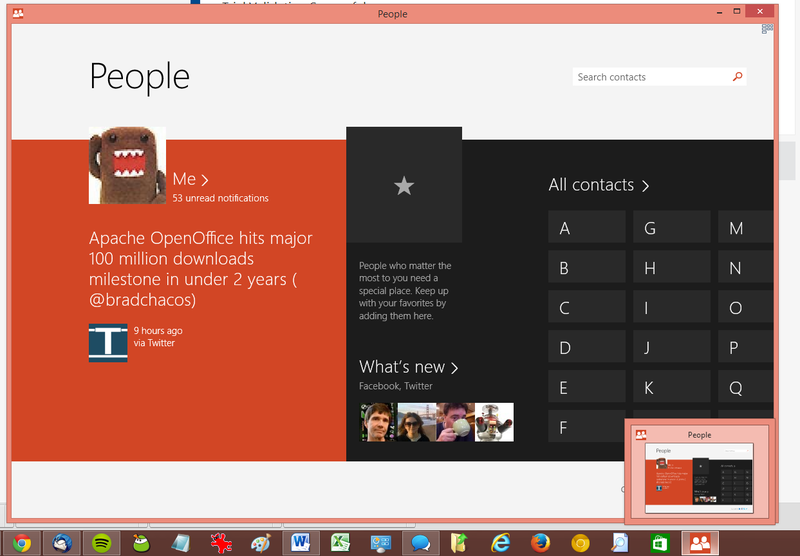 See the “Show Windows Store apps on the taskbar” option? It doesn’t mention the taskbar’s universal properties whatsoever, but it’s what you’re looking for. 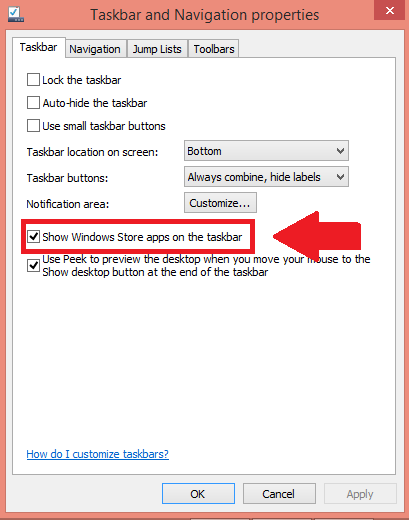 Uncheck it, then click OK.
Disabling that option obviously poses some problems if you hate the universal taskbar, but like the idea of docking Modern apps in the desktop. Fortunately, there’s a workaround there, too. Simply install Stardock’s superb ModernMix software, a $5 program that lets you run Modern apps in true desktop windows and offers its own ability to pin apps to the taskbar. When you have a Modern app running in a desktop window with ModernMix, an icon for the app appears in the taskbar—one that’s separate from the “official” icon that appears there when you’re not using ModernMix. These icons for opening a Modern app in ModernMix can be pinned to the taskbar even if you’ve disabled the “Show Windows Store apps on the taskbar” option. If you’re using ModernMix, Modern apps still appear in and can be pinned to the desktop taskbar, even if you’ve disabled Windows 8.1’s native ability to do so. Even if you plan to leave the taskbar intact, I still highly recommend ModernMix. 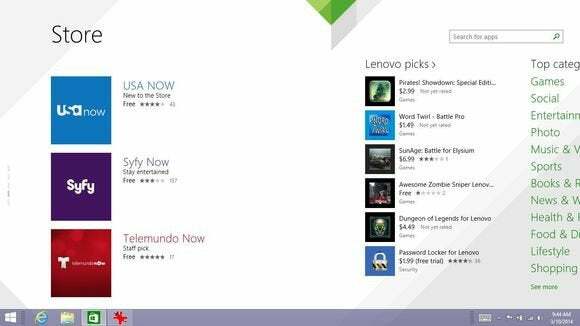 Running Modern apps in desktop windows is a wonderful ability, and ModernMix is key to getting Windows 9’s most anticipated features on your PC today.